Council websites have been around for over 20 years now. So it’s easy to think that they can be ‘just done’ so that our focus can move onto more exciting digital things. But in Stockport and Essex we’ve both been on journeys that brought us to an important conclusion: Flexibility of our content offer is key to how we redesign our services and engage with citizens. It’s only through an exceedingly well built web presence that we can provide services which meet user needs better than ever before. And there’s no doubt that users are consuming our content and services in ways which are changing and becoming more diverse. Only a modern, well built site can ensure, for example, that our services top search results – whether for voice assistants or desktop users. This requires the collaboration of a range of disciplines to fine tune the work: content, service and user experience designers; developers for front-end and back-end; visual designers; user researchers; data analysts and more. The temptation then is often to seek outside experts selling ‘council websites in a box’ for a quick solution to this challenge. There are good people working to provide a solid service in those companies. However, despite their best intentions, those products and their business models end up limiting our ability to achieve the level of quality, flexibility and openness that are fundamental to providing internet-age public services, as set out in the service standards. Procuring something for 4 or 5 years just doesn’t feel appropriate given the level of change we face. Stockport Metropolitan Borough Council have led the way in creating a superb platform for local government websites. Using the latest thinking around ‘headless’ CMS approaches, it’s future-proofed and has a series of great patterns and functions built into it. Stockport.gov.uk is a superb site as a result of this hard work, driving 60% of council contacts to now be digital. Essex County Council’s Service Design team have been working for the last year on plans to merge and replace the council’s 55 or so websites, mostly running on a dated SharePoint platform, with a single modern essex.gov.uk platform. Extensive discovery highlighted the limitations of many of the ‘quick win’ commercial options, but building from scratch felt not only expensive but a duplication of effort. Stockport’s approach soon came to light as a great opportunity, due to its quality and use of technologies Essex already had some in-house capabilities with. Furthermore Stockport’s agile, open approach for development and the roadmap meant that collaboration could be more than just downloading code – we could actually jointly work to improve the platform for our mutual benefit. County Councils and Metropolitan Borough Councils have different needs and services, so not all of the code will be mutually applicable. But there is so much commonality that we feel that if we can work together to use this platform jointly, then it should be workable for anyone in local government. This is exactly the spirit of collaboration we think the Local Digital Declaration is all about! We believe doing work such as open-sourcing the bookings feature, developing smart-answers (guided questions), compatibility with other CMS APIs and standardised content-types, will benefit not just us but all local government users. 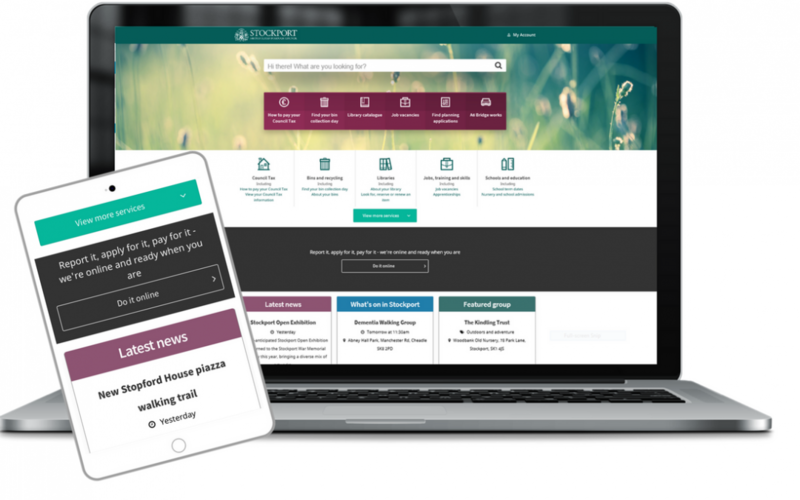 So we’ve applied to the MHCLG Local Digital Fund for support to help us get this collaboration going at pace, and accelerate making the platform useful for as many councils as possible. Without the funding we’ll have to focus on just making it work for our own users, while staying true to the open source spirit. But with the added oomph of the Local Digital Fund we think we can create a powerful web platform for all in double time. We’re very excited about this collaboration and hope more colleagues from across the sector will join us in making it a success.